Kilbeggan distillery was very nearly lost to the world in 1953 when Locke's whiskey company went bust. Happily, a succession of failed enterprises on the site meant there was still a distillery worthy of a huge restoration project in the early 1980s. The local community took charge, the picturesque water-wheel was set turning again, and a museum was opened on the site. In 1989, Cooley Distillery started producing spirit in Louth and was looking around for somewhere to mature its whiskey. It found that warehouse space in Kilbeggan. It also acquired the Locke's brand and replaced the lost copper pot stills with identical models it picked up in Tullamore. The Tullamore assets included a small pot still dating from 1830, at the latest. Though old, it was very well-preserved, having been used to distil water in its previous life. 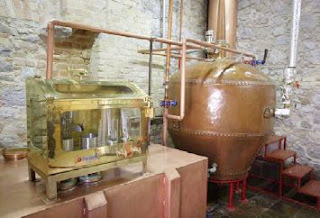 In 2007, Cooley began distillation at Kilbeggan again using this still. It was fed with the "low wines" that were the product of the first distillation at Cooley's Louth plant. It took three more years and the installation of a lot more equipment before Kilbeggan could tackle the entire whiskey-making process, from grain to cask. The original still was paired with a new one and a grain silo, mill and mashing and fermentation vats were added on site. In September 2010 the first pure Kilbeggan spirit in over 50 years was finally distilled. The resurrection was complete. Brian and Bernadette Quinn are perhaps the two people most intimately involved in this story. They moved into the old Kilbeggan distillery house in 1973 and worked on the restoration while Brian recorded the memories of those who had once worked in the distillery. Brian is now distillery manager, while Bernadette is product development manager. Brian and Bernadette were the guest speakers at September's Irish Whiskey Society meeting. Their knowledge of distillery operations past and present has ensured the continuity of whiskey knowledge at Kilbeggan. Alfred Barnard, who visited Kilbeggan around 1890 as part of his famous tour of distilleries met the then owners, John and James Locke. Brian mentioned conversations with old residents of Kilbeggan who remembered working with John and James. Quite remarkable. Fresh from the still, this was the first opportunity we had to try malt spirit entirely made in Kilbeggan. Brian explained that the narrow necks of the small stills lead to a lot of reflux during distillation. The result is a very light spirit. Raw spirit can be hard to drink but this 63% spirit was actually quite sweet and palatable. It will be at least three years before we see it bottled as whiskey. As I said, Kilbeggan restarted distillation in 2007, albeit with low wines from Cooley's main plant. Three years later this is legally whiskey and it has been bottled. Whiskey normally matures for longer but it was accelerated in this case by filling into quarter-sized casks. And the lighter nature of the spirit gave it something of a headstart anyway. Cooley have had a blended whiskey called Kilbeggan for years, made from malt and grain whiskey distilled in Louth. The strange thing is, I never liked it until now. On this night it worked for me. The bottle has recently received a makeover so I wondered if the contents had changed. I was assured by Brian that this is not so. The only other explanation is that I have changed. We had this last month at the Whiskey & Cheese tasting so I won't say any more about it here. I still think it's special. Cooley makes both peated and unpeated malt. As an experiment they ran the peated low wines through the Kilbeggan still back in January 2009. This will eventually appear as whiskey but we were trying it at only a year-and-a-half. Already good at that age though. It's a light version of Connemara, which is already a pretty refined taste. It will be bottled as a small batch under the Kilbeggan brand. According to Brian, all output from the Kilbeggan distillery will carry this name. The existing Kilbeggan blend will continue to be made in Louth, however, since it sells in volumes that the smaller distillery cannot handle. It's hoped to at least incorporate some genuine Kilbeggan malt into the blend in the future. This is the cask-strength version of the forthcoming Connemara "Turf Mór". Cooley had to buy malted barley peated to a higher level than they required a few years ago. They mixed it with plain malt to make standard Connemara but also distilled some at the higher level. This has now matured and will appear as a small batch heavily-peated Connemara version shortly. Only three years old but still voted the favourite of the night.